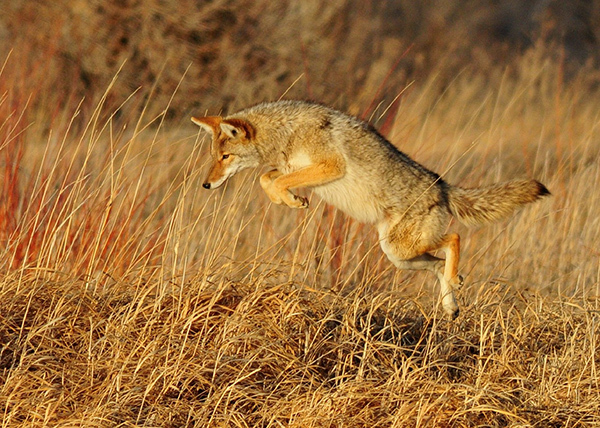 Coyotes are good jumpers: they can get all four feet about 48 inches off the ground. They are able to lift their front feet nearly twice that high. Throughout human history, coyotes have been known as Creators and Destroyers, Tricksters and clever Simpletons. They are paradoxes on four legs. Perhaps the reason we humans can’t seem to neatly categorize the coyote is because it is one of the most adaptable animals in the world. Canis latrans can change its breeding practices, diet and even social dynamics to survive in a wide variety of habitats. And coyotes have taken to our cities in big ways. In fact, a conservative estimate of the number of coyotes currently living in Cook County, Illinois—the second-most populous county in the U.S. after Los Angeles County, California—is more than 2,000. Our cities don’t seem to offer many obstacles: coyotes can easily leap an eight-foot wall and have been spotted climbing over a 14-foot cyclone fence. Coyotes have good senses of smelling, seeing and hearing, which—when coupled with evasiveness—enables them to survive both in the wild and right under our noses. Watch this video on the Cook County Coyote Project. We may want to add “Hider in Plain Sight” to our list of coyote categories. I LOVE coyotes, we have them all over Los Angeles… a alpha male in my neighborhood is nearly the size of a wolf, with a beautiful coat. Coyotes perform a great service as APEX PREDATORS in the urban environment; they eat rats, mice & feral cats (who would wipe out the bird population due to the rate that cats reproduce & the fact that they are an invasive, non-endemic species). Sorry to all you cat lovers, but your pet cat belongs inside your home. In Los Angeles, in your backyard they are killing birds (that we need to eat bugs) & are fair game for the Wiley Coyotes. L.A. County stopped killing coyotes a few decades back because they discovered that only the alpha pair mates & has a small litter, but when coyotes were being trapped & killed by Animal Control, they discovered that more coyotes pairs were mating & the litters they were having were larger. L.A. COUNTY ANIMAL CONTROL discovered that coyotes naturally control their own population for the area that they live in. Out in the CA deserts they keep the jack rabbit & mouse population in check too. Thank you Candice, this is a very interesting demonstration of the adaptability of the coyote. I also liked the manner in which the project was conducting its study…great stuff. Coyote population is on the increase here in Charlotte, NC as well. A great success story of wildlife adaptation to human population and land development growth. I guess the name Wile E. Coyote really fits. I live in an area of Henderson, NV and we have Rabbits, Coyotes, Bobcats and Cougars. Lately we have had a lot more Coyotes in our area then usual. I have had three run ins while being out with the dogs. The first time I was walking down the street with my Lab and there he was. I started walking across the street only to have him follow. So I yelled at him and told him to go home he left for the golf course. The next time I was walking the Lab and Doxie. Came around the corner and he was running across the road. The little 11lb doxie barked at him. I pulled her back because was not sure what he would do. the last time was just this week I was in the yard playing with the three dogs and he was in the neighbors backyard. Again I told him to go and he did. There is suppose to be 5 of them one male and 3 females and at least one pup but not sure if there are more in the area. Some of the neighbors feed them figuring they will leave there cats alone. I don’t let mine out back without me being there early in the morning or late in the evening. They have jumped fences and taken little dogs. A few weeks ago my 5 1/2 month old female German Shepard puppy and I were being stalked from behind by a coyote. I heard rustling in the grass and when I turned around I saw ears drop into tall grass. I walked over to where I saw the ears drop yelling “shoo, get out of here”. When I reached the patch of tall grass I saw a coyote just at the tree line. It was close, close enought to see its eyes, body contours. The coyote stayed within the tree line and followed us all the way back to the car. At one point I felt pretty vulnerable to a potential attack from behind. The next day a Ranger said since my dog was a female, the encounter could be chalked up to sexual curiosity.